One team was ready to win. The other had one good reason why it didn't. In the end, it was a "big" night for the Scappoose girls basketball team and a tough but not season-crushing loss for St. Helens. The Indians notched their first victory ever in the Class 5A Northwest Oregon Conference — and only their second win this season — as they beat shorthanded rival St. Helens 37-30 on Senior Night at Scappoose. "It's really, really awesome. A great feeling," Scappoose senior post Emily Kopra said. The Indians scored the first nine points, never trailed, and got their final 17 points (over the last 12 minutes) from either Kopra or junior post Gaby Dague. Dague was especially forceful, scoring nine Scappoose points in a row and 13 of those 17. "This was a big game for us," Dague said. St. Helens' top player, junior forward Maddie Holm, didn't get a chance to experience it on the court. 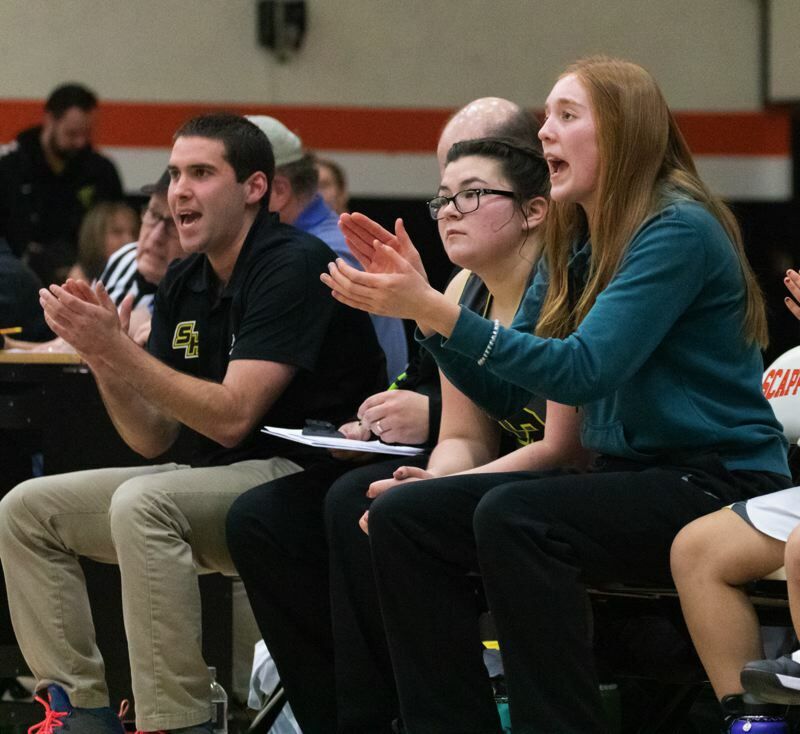 She watched in street clothes from the bench, held out as a precautionary measure after suffering a slight concussion in an early game fall the previous Friday at Wilsonville, Lions coach Michael Fendall said. To say the Lions are a different team with Holm in the lineup would be an understatement. When St. Helens played host to Scappoose on Jan. 11, Holm scored 27 points (Dague had eight), and the Lions won 45-36. Still, St. Helens had its chances on Tuesday — and the Indians maintained that they were ready to break through, even if Holm had been able to play. 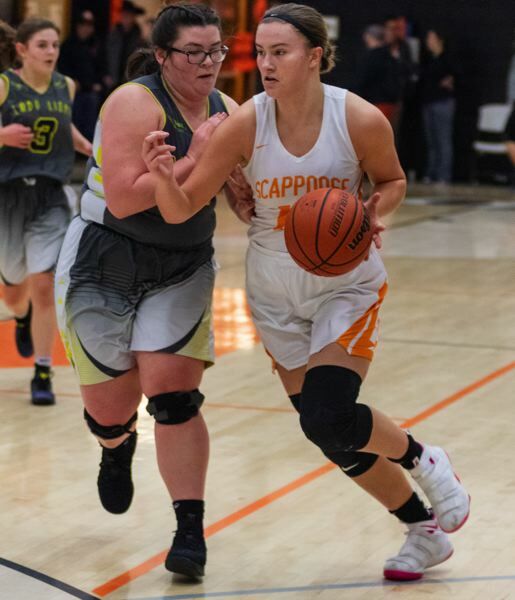 "I feel like we would have won even with her (playing)," Scappoose senior guard Sara Mills said, "because our defense has gotten a lot better since the first time we played them." Dague agreed, saying "I feel like we were ready for her." 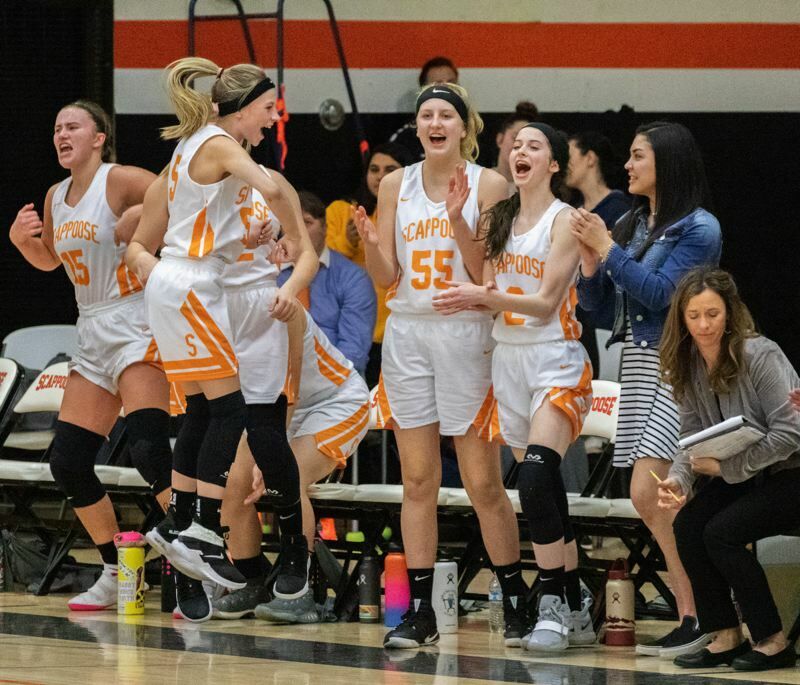 No doubt the Scappoose girls (2-16 overall, 1-8 in the NWOC in their first season up from 4A) have been coming on and been more competitive of late against every team in the league not named Wilsonville and La Salle Prep, which are state title contenders and simply at a different level. "Most definitely, the girls were ready to win a game," Scappoose coach Sarah Mann said after Tuesday's triumph. "We've come close and been in similar situations, and today we were on the other side of it." Everything aligned for the Indians. "So it was much more than just a win for us, it was a pride thing. It was all big for us." Scappoose's great start — with the Holm-less Lions struggling on offense — set the tone. St. Helens missed its first 11 shots from the field before senior forward Kaela Lee sank a 3-pointer with eight seconds left in the first quarter to pull the Lions to within 9-3. St. Helens never really found its shooting stroke. The Lions finished 3 of 26 from beyond the arc and went 5 of 35 from 2-point range for a combined 8 of 61 (13.1 percent). "A lot of them were good opportunities, too. Credit to Scappoose — they handled their business — but the first quarter, we had plenty of good looks, and we couldn't get even the close shots to fall," Fendall said. Scappoose, which hasn't been a 3-point-shooting team all season, was 0 for 3 behind the line but relied mostly on its posts to go 15 of 49 on 2-pointers. Dague totaled a game-high 19 points and led her team in rebounds with 14. Mills had seven points and eight rebounds. Kopra added five points and seven boards. For St. Helens, Lee had 15 points, going 8 of 11 at the free-throw line. And senior post McKayla Foster was a workhorse for with 15 rebounds and the defensive effort in the middle and on the blocks that helped keep the game within reach for the Lions. St. Helens cut its deficit to four points, at 28-24, with 4:48 to go, and then to 33-28 with 2:06 remaining. The Indians didn't cave, though. Their confidence seemed high all night, and from the start they played like a team with nothing to lose, while the Lions came out looking a bit tight. "In the fourth quarter, we started to think, 'We got this. If we can do things with a high basketball IQ the rest of the way, we'll be OK,'" Kopra said. Both teams have five games left in the regular season. The Lions (5-4 in league, 11-8 overall) are still on track to make the state playoffs, though nothing is a given. In particular, they could use wins Feb. 15 at Hillsboro, Feb. 19 at home against Putnam and Feb. 22 at Milwaukie. St. Helens is third in the NWOC, one game ahead of those three league foes. The top four finishers in the NWOC standings qualify automatically for the 16-team 5A playoffs. Holm is expected back for the next game, which is Tuesday, Feb. 12 at Parkrose. She's been practicing and as of Thursday was close to being able to return to full scrimmages with her teammates. Scappoose's next game also is scheduled for Feb. 12, when the Tribe plays host to Milwaukie — and the Indians will be going for their first winning streak. Till then, the win over St. Helens should keep their spirits high. "Every time we step on the floor, we've got to get better," Coach Mann said Tuesday, "and tonight we got better."